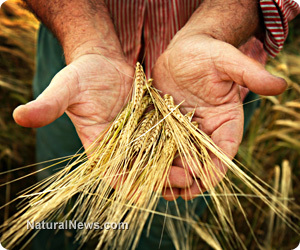 (NaturalNews) American wheat farmers are outraged over the recent discovery of unapproved genetically-modified (GM) wheat growing in Oregon, and one Kansas wheat farmer has decided to go on the offensive by suing the company responsible for this impetuous crime: Monsanto. Farmer Ernest Barnes of Morton County, located in Kansas' southwest corner, says he and many other wheat farmers throughout the state and across the country are losing profits thanks to Monsanto's recklessness, and that justice needs to be served. Last month, the U.S. Department of Agriculture (USDA) announced that an eastern Oregon wheat farmer found Monsanto's Roundup Ready GM wheat, which was never approved for commercial use, growing wild in his conventional wheat fields. Monsanto reportedly conducted test trials of GM wheat across the U.S. back in the late 1990s, but ended these trials after its product was wholly rejected by the industry and consumers. But the vagrant crop suddenly showed up out of the blue recently, which has harmed the U.S. wheat export market in a major way. You see, the rest of the civilized world views GMOs with far more skepticism and scrutiny than the U.S. does. Many countries require GMOs to be labeled, for instance, and some have flat-out banned GMOs on the basis that there has never been any long-term studies verifying their safety in humans. So as you can imagine, news that GM wheat had escaped and potentially contaminated large portions of the American wheat crop sent countries like Japan and South Korea, which are major wheat importers, running for the hills. As a result, American wheat farmers, who never agreed to have their crops or their businesses wrecked by Monsanto's insane recklessness, are now suffering financially and they want answers. Regardless of whether or not Monsanto intentionally released the unapproved GM wheat into the wild is irrelevant - this Monsanto-owned, patented product, which is not legally permitted for planting on U.S. soil, is turning up there, which means the biotechnology giant is fully responsible for any and all resulting damage. The irony in all this, of course, is that Monsanto has a sleazy track record of aggressively suing farmers just like Ernest Barnes whose crops inadvertently became contaminated by its patented and commercialized "Frankencrops." The only difference in this case, though, is that Monsanto's GM wheat is illegal, which means not only is Monsanto responsible to the general public for violating federal law, but it is also responsible for infringing on the rights of farmers by damaging their crops and negatively affecting international trade. The proverbial chickens are finally coming home to roost for Monsanto, which is good news for the future of humanity. If Monsanto is willing to unscrupulously exploit the legal system for its own financial gain by suing farmers who are actually the victims of its evil deeds, it is only fair that the vile corporation also be held fully responsible for violating federal law. Monsanto must also be brought to task and prosecuted to the full extent of the law for completely upsetting the international wheat trade, which is a major component of the national economy. "Monsanto knew, or should have known, that the existence of genetically-engineered wheat - commingled with the general wheat supply - would cause significant disruptions in the wheat export market, and that such a situation could involve huge disruptions in the wheat trade while imposing additional costs on U.S. wheat farmers and specifically Pacific Northwest soft white wheat farmers," explains a similar lawsuit filed in Idaho by a cohort of injured farmers from the Pacific Northwest.